RV Tire Safety: What is the "Best" tire? What is the "Best" tire? A couple of recurring questions on many of the RV Forums are "What brand tire should I buy?" or "What is the best tire for my RV?" While this seems like a simple, straight forward question, the answer is complex. Some people use past experience. If they used Brand Q in the past on their car and had no problems they believe that means they should have no problems on their 22.5" sizes. I don't think this is a sound way to make a decision on the quality of a company's tires. The information on the Ford Pinto gas tank made headlines, even though actual incident data concluded the Pinto was as safe as, or safer than, other cars in its class. But do the news headlines mean that the gas tank of a F350 will have problems? Others may have had a problem with a tire and since the root cause for the problem was not properly diagnosed, they decided the tire failure must have been due to a defect, so their position is that all Brand Q tires must be bad. Making this decision may be just as wrong as the previous example. In my experience, less than one percent of tire failures are really studied to the point that there is a high confidence in knowing what the real reason for the failure was. It may have been due to a puncture or a sidewall impact or leaking valve or out of align axle or damaged wheel or some other reason. Since most of the time people don't know the real reason, they simply say "I had a blowout" or "I had a bulge" or the "sidewalls were badly cracked" ...so they assume the tire must have been defective. 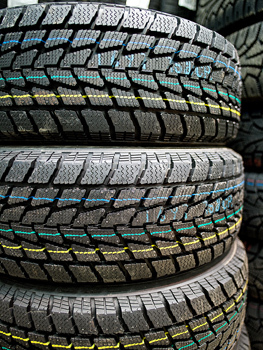 EVEN IF THERE IS A BATCH OF TIRES with some manufacturing defect, there could actually be only a dozen or so tires affected. Of course, it could also be thousands. The announced size of a recall is not a good measure as even if a company knows that a relatively small number of tires had the manufacturing error they have to recall many times more than the actual number as most times there is no easy way for consumers or even dealers to properly identify which tires were defective. I have personal experience of identifying a batch of less than 150 tires being made with an incorrect component. Given the opportunity, I felt I could have identified 99.9% of the tires with the defect but the cost associated with getting the tires shipped to Akron and completing the examination was prohibitive. And what does the owner do while this examination is going on? In the end more than 6,000 tires were recalled, scrapped and new tires given to customers to ensure that all the tires in the group of 150 were captures. The number 6,000 is what made the news not the 150. Also in light of the fact that there are lawyers that will be happy to file a lawsuit and hope the company will settle because they know it is less expensive to settle than go to the costs necessary to prove yourself innocent. Even when the facts are on the company' side, some juries will vote for the individual simply because they don't like big companies. I worked as an expert witness on such a case and even with physical evidence establishing where the fault of the accident was, the case was settled out of court rather than fight it. So I still haven't answered the question. I will however offer some guidelines and things to consider when you are trying to select a brand in your size. 1. Does the company have a nationwide dealer and store network to provide service and warranty support or do you have to contact some company with only one office and only a single person who can approve a replacement? A check of the tire manufacturer website will quickly give you a feeling of confidence or not, in its operations. Some tire companies offer a lot of information. Others may have a website but its internal company links do not work. The company does not provide any way to send anyone an email to ask a question. They don't even have an 800 phone number to call so you can talk to someone. I would be hesitant to deal with such a disorganized company. 2. What are the terms of the tire warranty? Many times there are both time and percentage figures regarding wear limits. Be sure you read and understand what is covered and what is not. 3. How do you obtain an adjustment? Do you only need to return the tire to a local dealer? or do you need to return the tire to the location where you purchased the tire?. Or must you pay to ship the tire to the importer many states away from where you live? 4. Have you consulted the NHTSA web site to see if there are recalls, investigations or even complaints on the specific tire you are considering? I think if you follow these four steps and ask yourself if the company you are considering deserves your business. Yes there is a temptation to simply buy the cheapest tires available but the saying "Pay me now or pay me later" is certainly appropriate when it comes to making this important safety related decision. Roger, I had a very interesting experience earlier this year (with Double Coin). Short story was that the tires were sturdy beyond belief, but slightly out of round, creating a balance-like problem. Absolutely superb customer support, but in the end we went through 11 tires to get 7 good ones. All different date codes too, from early 2011 to early 2012. I also learned a HUGE amount about balancing, and specifically road-force balancing. I would buy DC again, but only with a road-force balance installation (would have saved me a lot of grief). Matter of fact, I won't buy anything ever again without a road-force balance installation. We just got back from a nation wide trip of over 8000 miles mostly traveling on the interstate highways which have a big need of repair in some states. I think I found a motorcycle in one pot hole!! Before we left I ask my mechanic to go over my rig and he said my tires where close to the wear bars...he sent me to a truck tire dealer he uses and the guy said to buy Firestone since they are well made...in the USA (have not checked that out) and they have great nation wide service. Not the cheapest tire but considering I did not want my vacation to be ruined by problems I got 4 new tires for the rear of my 28' class C. I use a monitoring system and all I can say is that did they not only ride smooth but never did I have any problems with air pressure variances. I carry a compressor to touch up but only had to do that once in two months. I guess it says buy quality. I sure saw a lot of tire treads on the highways across the nation...not sure why so many except I believe $$$ is the problem. Not wanting to buy the best of not paying attention to pressure and temperature. http://www.harriger.com/tires.htm and use the first two characters of the DOT serial. Hope that helps.